Light: medium to low light, protect from direct sun. Grows leggier in lower light. These plants make wonderful specimen plants. There are many varieties and cultivars available. All are very durable and adaptable. They make great water culture plants. Their common name “dumbcane” comes from the unpleasant swelling and burning of the mouth that occurs if the plant is eaten. This is not due to a poison, but rather an irritation caused by calcium oxalate crystals found in the plant’s sap. Rinsing the mouth or skin with vinegar dissolves the crystals and reduces the swelling. A.) Dieffenbachia amoena ‘Tropic Snow’ –One of the largest and most spectacular of the Dieffenbachias. It can grow to 6 ft or more. B.) Dieffenbachia x exotic perfection –this cultivar grows compact and bushy. Leaves become more variegated with age. 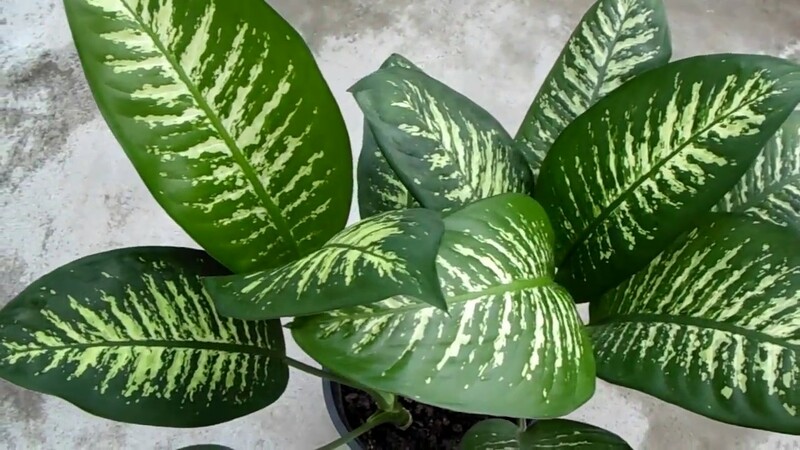 C.) Dieffenbachia picta (Gold Dieffenbachia) –large creamy or golden leaves lined in bright green. A moderately compact plant.